Louise Chéruit (not Madeleine) is another of those couturiers that has been forgotten by historical chance, whose style and contributions are almost unknown today, despite the fact that she may be the only designer mentioned in Vile Bodies. Unlike Pingat, we do know where Chéruit learned her trade - though in most sources there is a little confusion over whether it was Raudnitz et Cie, or Ernest Raudnitz. Raudnitz et Cie was opened in the 1870s by Ernest and his sisters, and in 1883 Ernest left to form his own house at 23 Louis-le-Grand, just down the street from Pingat. As Chéruit and her sister, Marie Huet, eventually took over Raudnitz et Cie, it's most likely that that was where they were both trained. In the January 1899 edition of Le Jacquard, a trade journal for the wool industry, Huet & Chéruit are noted as having set up to sell gowns and confections in December 1898 at 13 rue Grange-Batelière, in the premises that were previously run by Mme Raudnitz (the source is a list of people admitted as experts in, I think, a legal court; it's interesting that Mme Worth is one of them). For some time, the sisters kept "Raudnitz et Cie" on their labels above or below their names, most likely in order to remind longtime Raudnitz patrons that this was the same company. It even remained in the early 1910s, when Chéruit had moved to 21 Place Vendôme (a much more fashionable address). According to the Heilbrunn Timeline of Art, Chéruit purchased twelve of Paul Poiret's designs in 1898, which means that some of the first gowns the sisters showed under their own label might have been his. I'd like to have attended that show! The salerooms and fitting rooms of maison Chéruit are admirably decorated with wood and antique paintings. They are arranged with the most artistic taste. One of the rooms, amongothers, truly a little gem, possesses a remarkable ceiling, painted by Huet, which is a marvel of art and would be worthy of being in a museum. Maison Chéruit is the meeting place of the most refined clientele. They know well that they will find in all her designs impeccable art and absolute care for line which has made the renown of the house. Such exquisite creations in gowns, cloaks, and furs does the grand couture house, which has such influence over fashion and which decides in some way what it will be tomorrow, present us. The taste of Mme Chéruit, so original, so fine, and so personal, has placed the house in the first rank, in Paris and in the whole world. Further, we should not forget to add that, some years ago, Mme Chéruit created a new department for babies and little girls. I can find few sources from the earliest years of Huet & Chéruit; they pick up at the end of the 1900s, by which time the house is referred to only as Chéruit. In the Dry Goods Reporter (1903), it's referred to as Huet & Chéruit; a Parisian shopping guide (1907) refers to both sisters only in the index - in the main text, the house is known as Chéruit. (Some state or imply that the house became "Chéruit" in 1906; so far I've found no solid evidence of that, but the dating of these references make it seems likely.) Around the same time, Chéruit engaged in an affair with Paul Helleu, who drew numerous portraits of her. It's difficult to balance the positive statements about this or that designer being ahead of the trend in fashion magazines: they're made without actually knowing what's coming. But with the benefit of hindsight, we can read this article from the Woman's Home Companion (Fall fashion number, 1909) and interpret Paquin's princess cuts, Callot Soeurs' drapery, Drécoll's long suit coats, and, most significantly, Chéruit's raised waistline as trends that would continue into the 1910s. By 1910, Chéruit was among the top designers, listed as a genius with Paquin, Callot Soeurs, Poiret, and Drécoll; another magazine lists Chéruit as the second of nine couturiers that "are the chief representatives of this French supremacy" in the fashion business, together making almost 70 million francs a year. And when Lucien Vogel began the high end, extremely expensive magazine Gazette du Bon Ton in 1912, he chose to sign Chéruit along with six other top designers to exclusive contracts. In the same year, she was credited in several places as being a potential originator of the "panier effect", a piece of 18th century historicism, possibly drawn from her own collection of antique dress, that was the opposite of Poiret's lampshade tunic. The style might have been a precursor to a later skirt silhouette, popular in the late teens and very early '20s, which had more volume in the hips. Even without that influence, though, shorter overskirts were at the cutting edge of fashion at the time, and it's telling that Chéruit was a leading part of it. Last Spring this establishment changed the existing line of a woman's figure by making its greatest circumference just below the knee, and it was then rumored that the next step would be to drop the tight underskirt that increased the seeming size of the tunic's hem and lengthen the tunic into a full skirt, having one garment instead of two. This prophecy came true. Cheruit simply made the overskirt into a lower skirt, thereby putting the fullness at the shoetops instead of the line below the knees. And it really is at the shoetops, for never were gowns so short for street wear since the early days when our ancestresses went out in public far more uncovered than the modern woman dares to be. In 1915, Harper's Bazar was advertising itself in many other magazines with the promise of bringing readers the designs of Louise Chéruit, "master of the art of drapery" with "unquestioned standing", pointing to her power and popularity even during World War I. However, at the time she was apparently embroiled in a scandal involving an Austrian lover (though I can't find independent corroboration of this off Wikipedia), and there were rumors that she had been shot as a spy, as nobody had seen her in some time or knew where she was. 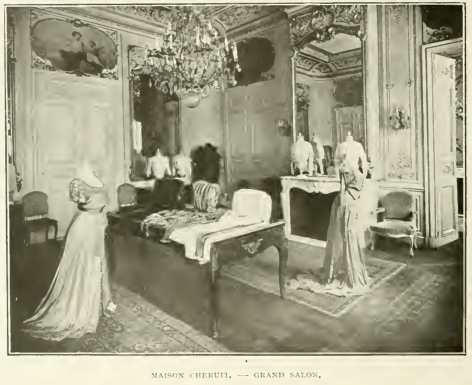 After the wave of 1915 ads touting Chéruit's name and skills, maison Chéruit is still included in lists of top couturiers, but references to being at the top of fashion or creating new styles cease - coinciding with the sale of the house to Louise Boulanger and a Mme Wormser. Apparently they considered changing the name of the house to Wormser and Boulanger in 1916, but, like Marie and Louise, they found it more profitable to retain the name their clients were familiar with. I can't find any more information on Louise Chéruit - the Wikipedia article says that she retired in 1923, but there's no evidence that she stayed on after selling the house. An article covering the house's designs in 1916 implies that she was no longer involved at that time. She died in 1935, and soon after Elsa Schiaparelli purchased the premises from Wormser (Boulanger started her own house, Louiseboulanger, in 1927) on her meteoric rise to success.